That's why I'm debating whether I should replace my '13 Sportswagon TDI with another. Instead of "getting legal", VW cheated on emissions for over a decade, and looks like all the top executives were in on the cheating. Makes one wonder what else they lied on, and while VW 'fessed up to the cheating, they have done peanuts to insure that such ethical lapses won't be repeated. VW's been good to me, but I come from a Ford family and hold Ford stick too, so I'm tempted to replace the TDI with a Ford. If Ford brings back the Ranger with a diesel, that'll seal the deal! Because social welfare Germany and the Works Council (union) won't allow VW to slim down to the size it should be*, it's only alternative is to increase profitabilty by making "cheaper" cars and sell them at the same high prices. Thus, the MQB platform was created. It's not a step forward in engineering and technology, rather, it's a "cheaper for VW to build" platform, engineered to be universally slipped under most of their models to reduce their per unit cost. You pay the same price as always, but receive a "cheaper" car. For that reason alone, I would not purchase a Volkswagen. * VW and Toyota build the same number of cars annually. Toyota does it with 300,000 people, VW with over 600,000. Though owned by Volkswagen, I would purchase a Skoda. Great cars. Though they have VW platforms, they are a cut above the VW brand product. VW allows Skoda a great deal of autonomy, because the unit has great management with strong profitability. If Ford brings the global Ranger and Everest to the US market, and doesn't ruin them by adding extra U.S. market features like engine fire mode, I'll be seeing you in the showroom. “There are a lot of diesel intenders and diesel-loyal people who are looking for a brand and vehicles to go after,” said Dan Nicholson, General Motors’ vice president for global propulsion systems. “They tend to be more tech savvy than the average customer. And they won’t stop wishing for a diesel. And we’ll go after those customers,” he said on the sidelines of the Center for Automotive Research’s Management Briefing Seminars here. Nicholson said he believes the U.S. market for diesel-powered cars and light trucks is still viable, despite Volkswagen’s diesel emissions scandal. “I think the U.S. is one of the few diesel growth markets on the planet,” he said. “I am very optimistic about the diesel market in the U.S. It has been abandoned by others and we are happy to step in and be the leader. Frankly that’s what we’d like to do,” he said. GM, Nicholson said, is seeing strong demand for the diesel-powered Chevrolet Colorado and GMCCanyon pickups. “We’re selling every one we can make and our sales targets are on track,” he said. Last month, Hinrich Woebcken, CEO of Volkswagen Group of America, told Automotive News that VW won’t relaunch “clean diesels” as a core element of its brand identity in the U.S., where VW dominated diesel passenger car sales before being consumed by its nearly yearlong emissions-cheating scandal. He said VW would use diesels where they make sense until at least 2019, but then toughening emissions standards would make the fuel-efficient engine extremely difficult to certify for U.S. sale. Volkswagen halted sales of diesel-powered vehicles last fall after regulators discovered VW used a defeat device to turn off emissions systems during testing. Parent company Volkswagen AG now has set aside nearly $20 billion to pay for legal settlements, fines and vehicle buybacks stemming from the scandal. Criminal investigations are ongoing in the U.S. and Germany. GM engineered the Cruze’s diesel engine at its Turin, Italy, powertrain engineering center. It is expected to develop 136-hp and 275 pounds-feet of torque. Consumer Reports urged the Justice Department to hike compensation for 475,000 owners of Volkswagen diesel vehicles that skirt U.S. emisisions rules, and allow owners who opt for a fix the right to later reconsider the decision. In comments filed on Friday on the proposed agreement, Consumer Reports said the buyback offer undervalues retail prices [no surprise there] and urged the use of values that "would lead to buyback offers for consumers that would be at least several hundred dollars higher." Consumer Reports also wants owners who opt for a fix to be able to change their mind and instead sell the car back to Volkswagen because the car may perform differently once a fix is performed. The public comment period for the Volkswagen consent decrees ends on Friday. U.S. District Judge Charles Breyer granted preliminary approval on July 26 to the settlement, which includes the largest-ever U.S. automotive buyback offer, and set an Oct. 18 hearing to grant final approval. Volkswagen agreed to spend up to $10.033 billion on the buyback for 2.0-liter vehicles that emit up to 40 times legally allowable pollution. It has agreed to separate settlements worth $5.3 billion to offset excess polluting, boost clean vehicles and compensate more than 40 U.S. states. Consumer Reports said it generally supported the settlement, but urged "regulators to wield robust oversight of Volkswagen to ensure that the company implements its recall, investment, and mitigation programs appropriately" and it called on "federal and state officials to assess tough civil penalties and any appropriate criminal penalties against the company in order to hold it fully accountable." VW still faces fines for violating the U.S. Clean Air Act and a potential consent decree that would subject it to oversight by an independent monitor, and must resolve the fate of 85,000 3.0 liter polluting vehicles. It also faces new civil suits from New York, Maryland and Massachusetts for violating state environmental laws as well as an ongoing Justice Department criminal investigation. Sloppy of Consumers Union, commenting after the comment period ended over a week ago and the deal is done. There's already a "lemon" procedure in the settlement to have a car bought back after the recall if the owner isn't happy with the fix. The buyout prices are generous in most cases, except for the 2015 models as there wasn't an established used market price to base the buyback offer on- VW should just pay those owners a minimum of list price and be done with it. For me and my 2013, if VW keeps giving me these freebees they're gonna put me in a higher tax bracket! U.S. authorities have found three unapproved software programmes in 3.0 litre diesel engines made by Volkswagen's Audi unit, German weekly Bild am Sonntag reported. The software allowed the turbocharged direct injection (TDI) engines used in Audi's Q7, Porsche's Cayenne and VW's Touareg models to shut down emissions control systems after about 22 minutes. Official methods to measure emissions usually last about 20 minutes. That settlement however would not address about 85,000 larger 3.0 litre Audi, Porsche and VW vehicles that emitted less pollution than 2.0 liter vehicles but were also fitted with illegal emissions-control equipment. Audi and Volkswagen admitted to U.S. authorities the presence of illegal emissions-control equipment in the 3.0 litre vehicles last year. Audi managers are scheduled to appear at a hearing in front of U.S. EPA on August 10. The German state of Lower Saxony, Volkswagen's second-largest shareholder, has no plans to sue the automaker for damages caused by its emissions-test cheating scandal, its prime minister, Stephan Weil, told reporters. Earlier this week, the state of Bavaria said it would sue VW, the first regional government in VW's home country to take legal action against the company. The states of Hesse and Baden Wuerttemberg sad they were considering joining Bavaria. VW's home state of Lower Saxony, which has a veto power on the automaker's supervisory board and holds a fifth of VW's voting rights, currently sees no legal basis to claim damages, Weil told Welt am Sonntag. "As a result there are no plans for a lawsuit," he said. Shares in VW plunged in the wake of the revelation of the cheating by U.S. regulators last September, hitting the state coffers and pension funds of German states. Bavaria's state pension fund for civil servants lost as much as 700,000 euros ($780,000). Robert Bosch rejected U.S. car owners' claims that 38 of its employees conspired with Volkswagen Group for a decade to develop technology that enabled diesel vehicles to evade pollution-control tests. Governments, investors and car owners around the world are gaining ground in efforts to pressure Volkswagen AG for settlements over its emissions-cheating scandal, aiming for terms similar to a $15 billion U.S. agreement. From Australia to South Korea to Ireland, governments and consumers are ratcheting up legal and regulatory demands in part because similar moves in the U.S. yielded a speedy shift to contrition from combativeness. In many of the countries where Volkswagen still faces legal action, it is arguing the defeat device on its diesel engines wasn’t illegal or the car emissions didn’t violate local rules, according to court records and documents reviewed by The Wall Street Journal. If the efforts succeed, the costs to resolve the diesel scandal could rise well beyond the €18.4 billion ($20.5 billion) the company has set aside. Of the roughly 11 million Volkswagen vehicles affected by its years long effort to cheat on diesel emissions standards, around 10.4 million are outside the U.S. While outcomes are still unclear, the company’s position has been chipped away by recent decisions. In Germany, the cost could rise as much as €4 billion following a ruling earlier this month by a court in Braunschweig, near Volkswagen’s headquarters. The court said it would address more than 170 suits filed by hundreds of Volkswagen investors who allege the company failed to quickly inform them of the diesel probe. Volkswagen has rejected the allegation. Another German court this month dismissed Volkswagen’s objections and ruled that local owners of tainted diesel vehicles had a right to return their cars to dealers for a full refund because of Volkswagen’s “massive fraud” with its diesel-powered cars. South Korea also this month banned the sale of 80 Volkswagen models, affecting more than 80,000 vehicles, and around 4,400 Korean consumers are suing Volkswagen and its luxury car unit Audi for damages from its false emissions claims. Korean authorities also fined Volkswagen and indicted a local executive on charges of fraud linked to the diesel scandal. Volkswagen faces additional class-action lawsuits, investigations by prosecutors and punitive damages in Australia, Brazil, Canada, Germany, Ireland, Italy, the Netherlands and Spain. Attorneys outside the U.S. are striving to build on the success of American legal action against Volkswagen. European lawyers working with Michael Hausfeld, a leading U.S. class-action lawyer who was part of the plaintiff’s committee that won the U.S. settlement, are assisting Australian and Irish attorneys. Australia has become a significant battleground because its vehicle-emission regulations are almost identical to European Union laws. If an Australian court determines that Volkswagen’s emissions system contained an illegal element known as a defeat device, Australia could become a precedent for billions of euros in claims in Europe. In the U.S., Volkswagen admitted to using a defeat device. Australian Federal Judge Lindsay Foster, who is presiding over a class-action suit in Sydney brought by law firms Maurice Blackburn and Bannister Law, chastised Volkswagen’s lawyers at a hearing on April 29, saying company executives in Germany “obviously think this is some kind of backwater,” according to the court transcript. He accused Volkswagen of intentionally stalling to delay a ruling in the Australian case until it was able to “bed down” lawyers and regulators in a settlement in the U.S.
“That’s what’s going on, I think, and I’m not having it,” he said, according to the transcript. An attorney for Volkswagen denied Judge Foster’s charge. Maurice Blackburn attorney Jason Geisker said the two sides are fighting over “the definition of what is a defeat device” and Volkswagen’s legal team isn’t yielding as it did in the U.S.
“A lot of effort is being put into this case by Volkswagen because of the broader consequences across Europe,” Mr. Geisker said. In July, Volkswagen’s attorneys in Australia denied the existence of illegal software to manipulate emissions. “There is no defeat device. That’s our case,” Noel Huntley, an Australian barrister representing Volkswagen, told the court, according to an official transcript of the hearing. In Europe, Volkswagen has denied that its customers suffered any damages and has ignored or denied claims seeking compensation. European lawyers say Volkswagen is stalling. They note that the one-year statute of limitations for damages suits in many European countries expires on Sept. 18. “Before that, Volkswagen will do nothing so that as many claims as possible will just go away,” said Eric Breiteneder, an attorney preparing class-action suits in the Netherlands on behalf of 106,000 European car owners and funds with more than €13 billion invested in Volkswagen stocks and bonds. Volkswagen has declined to enter settlement negotiations with Mr. Breiteneder. Evan O’Dwyer, an Irish attorney, has filed 20 individual claims against Volkswagen in low-level Irish courts, seeing damages that could go as high as €15,000 a vehicle. Under Irish law, Mr. O’Dwyer is not permitted to comment on the cases to the media. A&L Goodbody, a law firm representing Volkswagen in Ireland, has threatened to sue Mr. O’Dwyer and his clients for legal fees if he takes the cases to trial. In a letter dated Dec. 16, Goodbody urged Mr. O’Dwyer to drop a lawsuit on behalf of Eithne Higgins, a car owner, saying her complaint was without merit. Over at www.tdiclub.com there's been some discussion of this pushing VW Group into bankruptcy and ending the U.S. buyback/fix? of the offending TDIs. The US court handling the Volkswagen diesel emissions scandal turned up the heat on the German carmaker by ordering lawyers on both sides to begin “plan B” negotiations in case 85,000 cars that violate US pollution rules cannot be fixed. Judge Charles Breyer called it “intolerable” that Volkswagen cars with 3.0 litre engines that do not meet US standards continue to be driven on the road with no solution in sight. The cars are among nearly 600,000 vehicles that were fitted with illegal “defeat devices” and exceed Environmental Protection Agency standards for nitrogen oxide. Last month, the judge gave preliminary approval to a $15 billion settlement in which VW agreed to buy back or fix almost half a million of the cars, those with 2.0 litre engines. But the 85,000 3 litre cars were not part of the deal. VW has been adamant that it can fix those cars without any affect on their performance. VW has submitted several proposals to fix the cars, but after weeks of testing they have all been rejected. VW now has until October 24 to offer a new proposal, the court said. “It’s an iterative process, they’ve been going back and forth,” said a person familiar with the negotiations between VW and environmental regulators. Judge Breyer said that finding a fix was still “plan A”, but given that the progress was slow and he wanted the cars off the road, he ordered that a contingency plan, including settlement talks, be developed. “I am directing the parties to participate forthwith, and to come back on November 3 [with an update],” he told the lawyers. If Volkswagen were forced to buy back all 85,000 cars, it would be likely to add several billion dollars to the costs of the scandal. VW has estimated it will cost about €20,000 per vehicle to buy back the 2 litre cars. If the same price is applied to 3L cars, the cost would be €1.7 billion — but the 3 litre cars are generally newer and more expensive, so that total could be higher. VW has set aside about €18 billion for the scandal, which involves 11 million cars worldwide but the costs are centred in the US, where regulators first discovered the misbehaviour and emissions standards are high. Separately, lawyers told the court that VW had agreed to settle with 650 US dealerships which had sued the carmaker in April for fraud over the scandal. The dealers had sued the carmaker, seeking compensation for a drop in the value of diesel-engined cars and in their ability to sell new models. Volkswagen confirmed the settlement and said that it had agreed to “make cash payments and provide additional benefits to the dealers to resolve alleged past, current and future claims of losses in franchise value”. Robert Bosch GmbH demanded eight years ago that Volkswagen AG indemnify it (secure against legal responsibility for their actions) for using the emissions-cheating defeat device that it helped the automaker create for its diesel engines, U.S. car owners said in a new version of their lawsuit against both companies. “Plaintiffs do not have a full record of what unfolded in response to Bosch’s June 2, 2008, letter,” according to the filing. “However, it is indisputable that Bosch continued to develop and sell to Volkswagen hundreds of thousands of the defeat devices for U.S. vehicles” even after it acknowledged in writing that using the software was illegal in the U.S.
Volkswagen has already agreed to settlements that may total $16.5 billion (14.7 billion euros) to get 482,000 emissions-cheating diesel cars off U.S. roads. Those agreements cover car owners, the U.S. government and 44 states. That also includes $1.2 billion for VW dealerships, as well as a $603 million accord with states in the U.S. that isn’t part of the settlement to be considered for final approval later this year. Volkswagen still faces criminal probes, efforts by car owners in Europe to get U.S. Justice Department documents to buttress their own civil suits and a sales ban on many VW models in South Korea. The European Union, where most of the 11 million cars with the defeat devices were sold, is also pressuring VW to compensate car owners. Bosch, which isn’t part of any of the VW settlements, developed software to enable Volkswagen to beat emissions testing in the U.S. on its diesel vehicles, consumers claim. They’re seeking damages from Bosch beyond VW’s payments for additional compensation for owners and leasers of the vehicles. “The evidence already proves that Bosch played a critical role in a scheme to evade U.S. emission requirements,” consumer lawyers said last month in a partially sealed filing. Among the details included in the unsealed version of the filing Friday was the demand for indemnification for anticipated liability arising from the use of the “defeat device,” as Bosch called it in the letter. The term akustikfunktion dated back to use by Audi in the 1990s when it “devised software that could switch off certain functions when the vehicle was in test mode,” the lawyers alleged. Bosch concealed its knowledge of the defeat device in communications with U.S. regulators when questions were raised about the emission-control system in VW vehicles and “went so far as to actively lobby lawmakers to promote Volkswagen’s ‘Clean Diesel’ system in the U.S,” they said. Bosch maintained a “tight grip” over the engine control module software used on the VW vehicles and any modifications made to it, the lawyers claimed. Bosch “knew that Volkswagen was using Bosch’s software algorithm as an ‘on/off’ switch for emission controls when the class vehicles were undergoing testing,” they said in the filing last month. “Written communications between and within Bosch and Volkswagen describe the ‘akustikfunktion’ in surprising detail,” according to the unsealed document. “In e-mails sent as early as July 2005 from VW AG’s Andreas Specht” to four Bosch employees, “Specht discussed emissions measurements from vehicles using the ‘akustikfunktion’ in connection with U.S. emission compliance.” The names of the Bosch people remain sealed. In March 2007, an unidentified Bosch employee e-mailed VW requesting that it remove the description of the function from fuel pump specification sheets provided in the U.S., according to the complaint. Shortly after the exchange, VW developers confirmed to Bosch that the akustikfunktion wouldn’t be listed in the U.S. documentation, according to the filing. Bosch’s North American unit also “regularly communicated to its colleagues and clients in Germany about ways to deflect and diffuse questions from U.S. regulators,” particularly the California Air Resources Board, according to the unsealed complaint. As California regulators pursued Volkswagen to get to the bottom of its emissions scandal in the spring and summer of 2015, engineers at the carmaker who knew about the cheating were in a state of panic. A US legal filing unsealed on Friday shows a group of VW employees attempting to cover up the cheating as questions from the California Air Resources Board became more and more detailed. On May 12, one employee wrote about the emissions discrepancies between test conditions and real-world conditions: “We need a story for the situation!" The emails are quoted in an indictment, dated June 1, against James Liang, 62, a veteran Volkswagen engineer who spent 30 years with the company. On Friday he pleaded guilty to a conspiracy to defraud US customers and regulators. As VW admitted one year ago, up to 11 million of its cars were equipped with illegal “defeat devices” to recognise when its cars were undergoing tests. By detecting vehicle speed, acceleration, air pressure and the position of the steering wheel, VW cars knew when they were on a dynamometer — a sort of treadmill for cars — used for emission tests. The car would then flick on emissions control software to reduce nitrous oxide (NOx) pollution, hiding from regulators what it was actually spewing out in the real world. The discrepancies first came to light in March 2014, when a West VirginiaUniversity study raised questions about the real-world emissions of some VW cars. According to the case against Mr Liang, he and his team reacted to that study by pursuing “a strategy to disclose as little as possible” about the illegal software. They “intentionally made . . . false and fraudulent statements” to the Environmental Protection Agency and CARB to make the discrepancies appear as if they were “innocent mechanical and technological problems”. An official at CARB told the Financial Times in February that the emissions issue was initially treated as an anomaly, not an act of wilful misconduct. But he said VW engineers were unusually unco-operative. “They took issue with the way we conducted the tests, with the data we compiled, how we conducted the on-road measurements,” he said. With more time, it became “abundantly clear” something was off, because the car being tested was running “more cleanly when it was cold than when it was hot, contrary to all tenets of automotive engineering,” the official said. In the spring and summer of 2015, regulators improved their testing to effectively trick the cars into thinking they were on the open road. As a result the VW cars responded by emitting higher levels of NOx. The regulators soon discovered what appeared to be “a second set of commands” — one set for being on the road, another for test conditions. With its newfound knowledge, CARB asked more penetrating questions to the engineers, renewing panic with the community of employees involved in the cheating. Mr Liang worked for VW in the Wolfsburg, Germany, headquarters, where he helped develop the illegal software in 2006. In 2008 he moved to VW’s Oxnard, California, facility, where he helped diesel engines fitted with the software to be certified. The engines were at the centre of a major push to popularise its “Clean Diesel” technology. After the West Virginia study came out in 2014, Mr Liang helped his co-conspirators “continue to lie to the EPA, CARB and VW customers”. He also admitted that when, in early 2015, Volkswagen recalled half a million cars to “fix” the emissions problem, he knew the recall would not work. Mr Liang’s role in the conspiracy therefore involved two parts: the original cheating, as well as a cover-up to mislead regulators once they were on a path to detect it. What is not known is whether Mr Liang’s cheating, and his move from Germany to the US, was directed by higher management. U.S. prosecutors are investigating whether Germany’s Robert Bosch GmbH, which provided software to Volkswagen AG, conspired with the automaker to engineer diesel cars that would cheat U.S. emissions testing. Among the questions the Justice Department is asking in the criminal probe, one of them said, is whether automakers in addition to VW used Bosch software to skirt environmental standards. The line of inquiry broadens what is already the costliest scandal in U.S. automaking history. VW faces an industry-record $16.5 billion, and counting, in criminal and civil litigation fines after admitting last year that its diesel cars were outfitted with a “defeat device” that lowered emissions to legal levels only when it detected the vehicle was being tested. A second supplier may also be part of the widening probe: When prosecutors in Detroit outlined their case last week against a VW engineer who pleaded guilty to conspiracy in the matter, they said he had help from a Berlin-based company that is 50 percent owned by Volkswagen, described as "Company A" in a court filing. That company, according to a another person familiar with the matter, is IAV GmbH, which supplies VW and other automakers. IAV employees were part of a group working with Bosch and VW to develop emissions functions, according to U.S. court filings in a separate case. IAV and Volkswagen refused to comment. In Germany, prosecutors have said they are investigating whether Bosch employees helped VW rig software to cheat on emissions tests. In the U.S., Bosch is defending itself against a civil suit by drivers who allege that it not only conspired with VW to develop defeat devices, but also asked for legal protection from VW if the devices were used on American roadways. People familiar with the industry have said it’s common for carmakers to buy software from a company such as Bosch and adapt it to their own vehicles. There’s a limited universe of diesel-engine vehicles sold in the U.S., including cars made by VW, Daimler AG and BMW AG and light trucks by General Motors, Ford Motor Co. and Fiat Chrysler Automobiles. Bosch provides components for several of these, including GM’s GMC Sierra, Ford’s F-250, Fiat Chrysler’s Jeep Grand Cherokee and models by Daimler’s Mercedes-Benz. Informed in general about a government look into whether automakers beyond Volkswagen may have used defeat devices, spokespeople for Daimler, Fiat Chrysler, BMW, GM and Ford declined to comment. IAV, the parts-maker that is half-owned by Volkswagen, provides engineering and expertise to automakers mainly for new-car development, including software, electronics and technology support. Volkswagen is that company’s largest customer, according to documents unsealed last week in Detroit federal court, with other clients including Bosch, BMW, Chrysler, Ford, GM and Daimler. Under an agreement signed by VW and Bosch in 2006, IAV employees were among 35 individuals who were granted special access to documentation on “expanded software” created for certain emissions functions, according to a filing in a civil lawsuit. The agreement, which the plaintiffs say they received from VW during discovery in the case, shows the extent to which Bosch sought control over any modifications to its software, they allege in the filing. Bosch has yet to respond in court to the allegations. Beyond VW, other automakers face emissions-cheating lawsuits in the U.S. or accusations overseas of poor emissions performance. Daimler’s Mercedes-Benz has no 2017 diesel models listed among the more than 50 entries on the EPA’s fueleconomy.gov website. For 2016, the 70-plus models included the diesel-powered GL350 Bluetec SUV and E250 Bluetec sedan. The brand hasn’t announced a date for any diesel models to go on sale. Earlier this month, the German Transport Ministry asked the European Union to investigate allegations that three Fiat Chrysler vehicles sold in Europe had defeat devices. Italy and Fiat have denied the accusations, with the Italian Transport Ministry sayings its own tests showed no unauthorized devices on the vehicles. Other diesel vehicles in the U.S. include Nissan Motor Co.’s Titan XD pickup and Tata Motors Ltd.’s Land Rover Range Rover Sport Td6, which went on sale after the VW scandal erupted a year ago. Tata’s Jaguar has diesel versions of its 2017 F-Pace crossover and XE and XF sedans approved by the EPA and just starting to reach dealerships. Volkswagen’s former CEO, Martin Winterkorn, approved a plan to disclose only partial information on the carmaker’s software rigging to U.S. authorities seven weeks before the scandal broke last year, Bild newspaper reported, citing newly uncovered documents. On July 28, 2015, Winterkorn signed off on talking points prepared ahead of an informal meeting with regulators in the U.S., at which VW officials would “partially” disclose details about diesel software that cheated on emissions. At the meeting, which took place on Aug. 5, VW employees acknowledged that emissions didn’t meet U.S. standards and that engineers were working to repair it. Seven weeks later, U.S. authorities revealed that VW had flouted environmental regulations, plunging the carmaker into the worst crisis in its history. Winterkorn, who stepped down soon after the revelations, is the subject of a probe seeking to find out whether management was too slow to tell investors about the potential cost of the diesel-emissions scandal. VW has said Winterkorn was present at a meeting in July 2015 in which the diesel situation was a topic on the “periphery” of the gathering. Bild also reported that several VW engineers who were offered suspended sentences and fines in exchange for confessions declined the overture. German supplier Robert Bosch, which provided VW with software, has also suspended several employees as a result of the investigations. At the meeting with CARB’s Alberto Ayala, the “issues” with Volkswagen’s diesel engines should only be “partially disclosed,” the memorandum says. This “approach has been confirmed by Prof. Winterkorn on July 28, 2015” the paper says. A day before the memo was written, “the issue” was the topic at Volkswagen’s “Schadenstisch” (literally “damage table”) a regular crisis and damage control meeting by experts from various departments of Volkswagen. “Are we talking about CO2?” Winterkorn is quoted to have asked at the meeting. “No, it’s nitrous oxide,” he was told. The last sentence hints on the direction the leak might be taking. In recent days, German courts have been flooded with lawsuits by investors who claim they lost billions when the company’s shares crashed. To beat a one year statute of limitations, “fax machines overheated” at German courts a week ago, Bloomberg said. One German law firm delivered more than 5,000 complaints by truck. The claimants allege that Volkswagen violated the “ad-hoc” rule requiring the speedy release of findings that might impact the value of a company’s shares. Lawsuits disclosed so far seek nearly $12 billion in damages. On July 8, 2015, CARB informed both the EPA and VW that it found glaring discrepancies between real world emissions and when Volkswagen diesel cars were on the “rolling road” in a testing lab. ”VW offered up excuses for the inconsistency in tailpipe NOx levels, but the EPA wasn’t buying it,” writes Mashable. One year ago, on September 18, EPA went public. Volkswagen and auto supplier Robert Bosch have asked a U.S. federal judge to reject requests from European investors and vehicle owners to access more than 20 million pages of records turned over in VW's "Dieselgate" scandal. VW, which admitted in 2015 to programming its diesel engines to deceive U.S. emissions testers, faces more than 1,200 lawsuits, consolidated before a judge in San Francisco. The automaker has agreed to pay up to $16.5 billion to resolve claims from some owners, dealers and government regulators. A new study by Transport & Environment (T&E) shows that Volkswagen is currently selling the least polluting (Euro 6) diesel vehicles. However, the report “Dieselgate: Who? What? How?” also found that no brand in Europe complies with the latest Euro 6 air pollution limits for diesel cars and vans in real-world driving. T&E’s calculations also suggest that today 29 million diesel cars and vans that T&E classifies as “dirty”—3x the Euro 5 NOx limit—are driving on Europe’s roads. The largest number of such diesels is found on French roads (5.5 million), followed by Germany (5.3 million), the UK (4.3 million), Italy (3.1 million), Spain (1.9 million) and Belgium (1.4 million). For Euro 5 vehicles, the five worst performing companies were (in order of the highest emissions): Renault (including Dacia); Land Rover; Hyundai; Opel/Vauxhall (including Chevrolet); and Nissan. The ICCT authors observed that Volkswagen’s performance on the Euro 6 side was not a result of the VW Group “learning its lesson” from the Dieselgate scandal; the group brought its Euro 6 cars to market ahead of the scandal was exposed. VW Group’s Dieselgate engines were mostly of the previous Euro 5 generation. Loopholes. T&E charges that diesel cars are failing to operate their exhaust after-treatment systems for most of the time the car is driving, “almost certainly illegally misusing” a loophole in the rules governing the use of Defeat Devices. Over the last 12 months investigations in Europe (notably the testing programmes in Germany, France and the UK) have shown that the scandal engulfing VW represents the tip of an iceberg. Most carmakers systematically manipulate cars to pass emissions tests through highly questionable and probably illegal means. This results in performance that achieves regulatory limits in a lab but exceeds these by 10 times and more when the emissions are measured on the road. Such behaviour that has been going on for at least six years and probably longer. 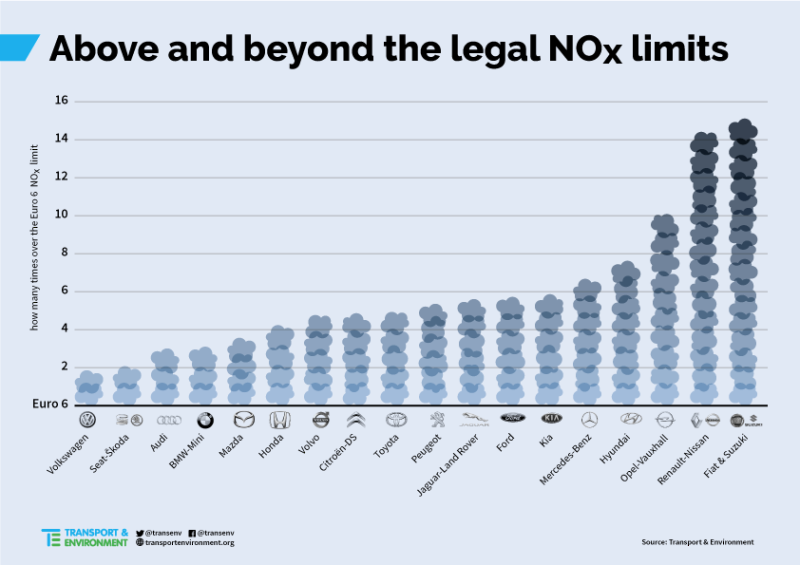 Regulatory limits for NOx emissions are also breached by a significant margin when tested in conditions even slightly divergent from those prescribed in the EU test protocol (NEDC). The principal reason for such gross exceedances is that carmakers routinely switch-off technologies that clean up the exhaust when the car is driven on the road, and only operate these fully during the narrow conditions of the tests. This is partially to improve official fuel economy figures but is also due to questions about the durability of the emissions treatment systems carmakers have used—specifically exhaust gas recirculation systems that pump hot exhaust gases with a lower oxygen content back into the cylinders to lower production of NOx. Investigations have revealed that national testing authorities have failed to scrutinize the way in which these exhaust after-treatment systems operate (despite a legal requirement for them to do so) and for a decade have turned a blind eye on this unprecedented maltreatment of emissions regulations. In addition to automakers’ exploitation of regulatory loopholes, T&E further charged, the laboratory test procedure used to measure the pollutant and CO2 emissions in Europe today is “totally unrealistic and undemanding and in no way representative of real-world driving conditions”. 1. Thermal window defeat device. Almost all models identified show the presence of a “thermal window” defeat device. These switch off or lower the effectiveness of the exhaust treatment systems at temperatures below those typically used during laboratory tests (23 - 29 °C). Manufacturers claim such behavior is needed to protect the engine but the temperatures at which the exhaust treatment effectiveness is lowered is much higher than necessary in many models. 2. Hot restart defeat device. A high number of the high-emitting models on the road show much higher emissions after a hot engine restart than when the engine is cold. Manufacturers say that high emissions are generated by hotter engine temperatures and pressures experienced at warm restarts; however, T&E noted, emissions generated are both a function of the combustion and effectiveness of the after-treatment that should be much better when hot, as found in data obtained by the ICCT from the EPA. High warm start emissions are highly suspicious and possibly suggest that during a cold start a different and more effective engine and exhaust calibration is being used (as the EU test mandates cold starts), T&E said. 3. Cycle detection defeat device. The German type approval authority (KBA) found evidence earlier this year that the exhaust treatment system in some Fiat models would switch itself off after 22 minutes; emissions tests normally run for around 20 minutes. Despite the Italian Transport Ministry (that approved these cars) denying the accusation, KBA are currently asking the European Commission to investigate Fiat 500X models for the presence of this defeat device. The European Commission is far from blameless. It took too long to develop new real world tests that should have identified and resolved some of the issues much earlier. It acceded to the demands from the Member States to weaken new NOx limits for cars and delay their introduction. It designed the type approval regulation in a way that meant no effective checks and balances were built into the system. However, the Commission has acted promptly to reform the system of type approval with good (but not sufficient) proposals to strengthen the rules. It has also made clear its intention to bring infringement proceedings against member states that fail to enforce the law on defeat devices – it now must do this and coordinate an EU-wide recall of vehicles abusing emissions regulations that will ensure air pollution limits are met earlier throughout Europe and fewer people die prematurely. The U.S. Justice Department is assessing how big a criminal fine it can extract from Volkswagen AG over emissions-cheating without putting the German company out of business. The U.S. is sizing up Germany’s biggest carmaker at the same time it’s trying to settle a civil case with the country’s largest bank, Deutsche Bank AG -- two companies that, together, directly account for more than 320,000 German jobs. In the case of Deutsche Bank, which is seeking to settle U.S. allegations over its crisis-era mortgage securities business, investors are asking whether the Justice Department would seek a penalty so high that it would leave Deutsche Bank short of capital, forcing it into a rushed sale of assets and stock. As the U.S.’s Volkswagen calculations show, the department is showing that in some cases, it will take a company’s financial health into account. It’s not clear what penalty range the U.S. is considering in the criminal case against Volkswagen. The company had net liquidity of 28.8 billion euros ($32.4 billion) as of June 30, and Chief Financial Officer Frank Witter said his goal is to keep the target for average net liquidity at 20 billion euros to ensure funding needs and protect the company’s credit rating. The carmaker generates several billions of dollars of cash each quarter and could tap into a credit line or raise capital if necessary to pay its obligations. Volkswagen has already agreed to pay an industry-record $16.5 billion in civil litigation fines in the U.S. after admitting last year that its diesel cars were outfitted with a “defeat device” that allowed them to game U.S. environmental tests. The carmaker is also on the hook for outstanding civil claims from several states and as much as $9.2 billion in investor lawsuits in Germany, where it’s also under criminal investigation. “The department doesn’t pick a number in a complete vacuum," said William Stellmach, a former federal prosecutor now at Willkie Farr & Gallagher LLP in Washington. "There are a number of cases where it has acknowledged that the impact of a financial penalty on a company was a factor in deciding what that penalty should be." It’s not clear whether the department is making similar calculations as it negotiates a civil settlement with Deutsche Bank over its dealings in residential mortgage-backed securities. The German lender has been under U.S. scrutiny along with other banks over its role in packaging and selling toxic debt that led to the 2008 financial crisis. Fines by the department for mortgage-backed securities alone total $41 billion for five banks, with five more banks yet to settle, including Deutsche Bank. Press reports that the U.S. began negotiations by asking it to pay $14 billion to settle the case rattled markets as investors grew concerned about the bank’s ability to raise capital. Deutsche Bank shares fell to a record low in Germany and were down 2 percent at 10.34 euros at 11:32 am local time. Volkswagen stock was down 2.4 percent at 123.60 euros. "A fine that would place VW’s very future in question would need to be so much larger than those we have seen in recent history, we wonder whether it could be justified," Arndt Ellinghorst, a London-based analyst at Evercore ISI, wrote in an e-mail. His forecast is for 10 billion euros in civil and criminal liabilities in the U.S. The ability-to pay assessment doesn’t necessarily result in a lower number, according to Stellmach, who isn’t involved in the VW case. Rather, the department can structure an agreement to soften some of the sting, such as an installment plan allowing for deferred payments, he said. Companies can also receive credit for penalties assessed by other regulators or authorities both in the U.S. and abroad. VW has plenty of money to meet further fines, particularly because penalties tend to be paid over long time periods, according to Joel Levington, a Bloomberg Intelligence credit analyst. "Despite all the damage that its reputation has taken, VW is still a company that might be back to generating $5 billion in free cash flow in 2018, and when you generate that kind of cash, it absolves a lot of sins," he said. The Justice Department began negotiations on the criminal penalty in August, one person said. Volkswagen has been doing well, despite all of this. Although sales of VW-brand cars fell in the first half of the year, the German manufacturer has benefited from gains by its Audi, Porsche and Skoda brands, as well as its strong position in China. Volkswagen outsold Toyota Motor Corp. in the first six months of 2016, making it the world’s biggest automaker for the period. The sales gains have brought Volkswagen back to profitability this year and sparked a surge in its net liquidity, which is a tally of cash minus debt. With the diesel-cheating scandal, Volkswagen has become one of the latest companies subjected to a Justice Department calculation of how severe a penalty needs to be to change corporate behavior and deter other businesses from illegal conduct. That analysis includes the U.S. case against BP PLC after the 2010 Deepwater Horizon offshore oil spill. BP paid out about $25 billion to resolve civil and criminal claims, including $4 billion as part of a guilty plea in 2012. The government is following the Deepwater playbook in the current case, one official said after the government filed its civil claim in January. Volkswagen, like most carmakers, also has a financing unit, which offers buyers loans or lease packages when they are ready to buy their cars at a dealership. Should the company’s cash level fall too low, it could spark ratings downgrades by credit agencies, which risks increasing the costs of that unit. Standard & Poor’s Ratings Services said in a note in February that it would consider lowering the carmaker’s rating only if its litigation costs exceeded 40 billion euros ($45 billion) or if its legal costs caused a severe negative impact on the company’s liquidity position, a scenario it considers unlikely. By that measure, after U.S. civil penalties and accounting for maximum damages in German lawsuits, the company would still have a cushion of about $20 billion to absorb other litigation and investigation-related expenses. Volkswagen is currently rated BBB-plus by S&P, three levels above junk. S&P has warned that it may cut Volkswagen’s rating further. “The negative outlook is still there and that reflects the risks that there could be more charges,” said Alex Herbert, the London-based analyst who wrote the February report. Alcoa Inc., which the Justice Department said got a benefit of more than $400 million from a foreign bribery scheme, paid a $209 million criminal fine in 2014 after prosecutors considered the effect of the size of the penalty on Alcoa’s ability to fund capital expenditures, research and development and pension obligations, and the company’s "substantial cooperation" and its anti-corruption efforts, court documents show. 22 million pages??? Seems like producing that many copies is penalty enough. How many people does it take to analyze that much data-a stack of paper over 2000 ft. high. Of course its not paper-assuming most of the stuff is in some sort of electronic file but think of the cost of the investigation alone??? The state of Missouri sued Volkswagen AG on Monday, becoming the 17th U.S. state to take legal action against the German automaker over its cheating on diesel emissions. Separately, U.S. District Judge Charles Breyer on Tuesday in San Francisco is set to hold a hearing on whether to grant final approval to a $10.033 billion settlement with 475,000 owners of 2.0-liter Volkswagen vehicles. The proposed settlement would allow owners to sell back their polluting vehicles or get a fix if regulators approve. "Volkswagen’s actions demonstrate a flagrant disregard for Missouri’s environmental laws, as well as the health and welfare of Missourians," Missouri Attorney General Chris Koster said in a statement on Monday. VW spokeswoman Jeannine Ginivan said on Monday the company "is committed to reaching a fair and efficient resolution of remaining federal and state diesel claims in the United States." She said the automaker "will review Missouri’s complaint and respond appropriately." Volkswagen AG is asking for a final sign-off on its $14.7 billion settlement with drivers as it continues to seek regulators’ approval of a fix for 482,000 pollution-spewing vehicles still on U.S. roads. Without an approved repair, VW may be left with only one option: buy back the cars with so-called defeat devices from the owners. And the German automaker might have to do the same for a smaller group of vehicles with larger 3.0-liter diesel engines equipped with the emissions-cheating software. VW reached the settlement covering the 2.0-liter engines in June with consumers and regulators including the U.S. Environmental Protection Agency. With a San Francisco federal judge set to consider final approval of that deal Tuesday, the EPA has yet to approve any of VW’s proposals to fix those cars, said a person familiar with the matter who wasn’t authorized to speak publicly. So far, regulators led by the California Air Resources Board have been critical of the carmakers’ attempted solutions. CARB has twice rejected VW’s recall plans -- once in a January letter related to the 2-liter engines and again in a similar July statement for the 3-liter models. VW has agreed to spend as much as $10 billion to buy back 2-liter models and compensate drivers. It also agreed to pay $2.7 billion to federal and California regulators to fund pollution-reduction projects and pay $2 billion to be invested in clean technology. A court conference is set for Nov. 3 on VW’s negotiations with regulators and consumer lawyers on a solution for the 85,000 vehicles with 3-liter engines, including the VW Touareg, Porsche Cayenne and Audi Q5. The automaker has earmarked almost $19.6 billion (17.8 billion euros) to extricate it from the emissions-cheating scandal. That includes $1.2 billion to its U.S. franchise dealers, along with $86 million to California and $603 million to other states over violations of consumer protection laws. VW still faces criminal probes, shareholder claims and environmental lawsuits by multiple states as well as lawsuits and a criminal probe in Europe. U.S. District Judge Charles Breyer allowed the settlement to move ahead in July, calling the proposed agreement “fair, adequate and reasonable.’’ At Tuesday’s hearing to determine whether the agreement is fair, Breyer is set to consider objections on behalf of more than 400 car owners. Breyer has allotted no more than two minutes for arguments to each of the critics. Car owners could have gotten the same deal -- buybacks and compensation -- through VW’s settlement with federal regulators, according to the Center for Class Action Fairness, an advocacy group primarily complaining about the estimate of more than $300 million in fees to be paid plaintiffs’ lawyers. The Center also said the announced value of the settlement was inflated. Consumer lawyers were essential to the quick settlement, they argued in court filings last month. Attorneys’ fees will be limited to $324 million, far below the typical share in class-action settlements. A U.S. federal judge today approved Volkswagen AG's record $14.7 billion settlement with regulators and owners of 475,000 polluting diesel vehicles, and the German automaker said it would begin buying back the cars in mid-November. It represented one of the biggest corporate settlements of any kind. The action by U.S. District Judge Charles Breyer in San Francisco marked a pivotal moment for VW as it aims to move past a scandal that has engulfed the company since it admitted in September 2015 to installing secret software in diesel cars to cheat exhaust emissions tests and make them appear cleaner than they really were. Hinrich Woebcken, CEO of Volkswagen Group of America Inc., called final approval of a settlement first announced in June "an important milestone in our journey to making things right in the United States," and pledged to carry out the terms "as seamlessly as possible." Breyer turned away objections from car owners who thought the settlement did not provide enough money, saying it "adequately and fairly compensates" them. In addition to the pre-scandal "trade in" value of the vehicle, owners will receive $5,100 to $10,000 in additional compensation. "Given the risks of prolonged litigation, the immediate settlement of this matter is far preferable," Breyer wrote. The settlement was reached with the U.S. Justice Department, Federal Trade Commission, the state of California and vehicle owners who had filed a class action lawsuit against the world's No. 2 automaker. VW has admitted to misleading regulators and still faces an ongoing criminal investigation. Volkswagen agreed to spend up to $10.033 billion on the buybacks and owner compensation and $4.7 billion on programs to offset excess emissions and boost clean-vehicle projects. VW may also be allowed to repair vehicles if regulators approve fixes. The affected vehicles emit up to 40 times legally allowable pollution levels. In total, Volkswagen has agreed to date to spend up to $16.5 billion in connection with the scandal, including payments to dealers, states and attorneys for owners. The scandal rattled VW's global business, harmed its reputation and prompted the ouster of longtime CEO Martin Winterkorn. VW still faces billions more in costs to address 85,000 polluting 3.0-liter vehicles and Justice Department fines for violating clean air laws. It also faces lawsuits from at least 16 U.S. states for additional claims that could hike the company's overall costs. Last month, a Volkswagen engineer pleaded guilty to helping the company evade U.S. emission standards. His lawyer said he would cooperate with federal authorities in their criminal probe. In 2013, a non-profit group commissioned researchers at West Virginia University to test diesel car emissions, and found excess emissions in two VW diesels. After the U.S. Environmental Protection Agency and California spent more than a year trying to understand the cause, VW admitted last year it secretly installed software to turn off emissions equipment in real-world driving. "Today is a landmark day, when this innovative settlement can be put into action, investing billions of dollars into public health protections to remedy these serious violations," Cynthia Giles, the EPA's assistant administrator, said in a statement. VW will provide $2 billion over 10 years to fund programs to promote construction of electric vehicle charging infrastructure, development of zero-emission ride-sharing fleets and other efforts to boost sales of cars that do not burn petroleum. Volkswagen has been in intensive talks over how much compensation it may offer owners of the larger 3.0-liter diesel Porsche, Audi and Volkswagen vehicles that emit up to nine times legally allowable emissions and whether it will offer buybacks for some of the polluting SUVs but no final agreement has been reached. Volkswagen faces a Nov. 3 court hearing to update the court on those vehicles' status. Nearly 340,000 owners have registered to take part in the settlement. About 3,500 owners have opted out. Volkswagen must fix or buy back 85 percent of the 475,000 vehicles under the agreement by June 2019 or face additional costs. Volkswagen Group has been under investigation for more than a year, as officials on three continents have pored over documents and testimony, digging for evidence that the automaker's top leadership approved the diesel-cheating program that has plunged the company into crisis. In Germany, the hunt has come up empty so far, prosecutors say. In Brunswick, the closest office to Volkswagen's home town of Wolfsburg, prosecutors are investigating 21 people and have a "fairly good" picture of how the scandal evolved, according to Klaus Ziehe, the spokesman. That doesn't include any clear-cut link between top executives -- who make up the company's management board -- and the decisions to implement the scheme. "If we had reasonable indications in the diesel probe suggesting that board members knew something about illegal action, we would put them on the suspect list, and we would also have communicated that to the public," Ziehe said, speaking of the management board. "You may understand from the fact that this didn’t happen that so far we don’t have these indications." The automaker admitted last year to systematically rigging environmental tests for diesel emissions, forcing its former CEO Martin Winterkorn to resign and exposing it to fines and other costs that have already reached $20 billion. Volkswagen has had to cope with a ban on sales of diesel models from the group in the U.S. and an avalanche of lawsuits and probes over the issue that have pushed to find how high up the decision-making went. The company has repeatedly said there was a limited group of engineers behind the wrongdoing and no one at the top was a part of it. Like many European companies, Volkswagen has a management board made up of top executives as well as a U.S.-style board of directors known as a supervisory board. VW’s supervisory board hired U.S. law firm Jones Day last year to run an internal investigation to get to the bottom of the matter. Those lawyers report to the U.S. Department of Justice and VW’s supervisory board, which created a special six-member committee to deal with the diesel-emissions scandal. The Justice Department is conducting its own criminal probe and may reach a settlement with the carmaker by January. It secured one guilty plea by a veteran engineer last month. VW has repeatedly stated that top management were unaware of the decision to install the software to cheat emissions tests. "The then and current board of management of Volkswagen AG had, at any rate, no knowledge of the use of unlawful engine management software at the time," Volkswagen wrote in its annual report for 2015. Later reports declared that nothing changed in that statement. The carmaker declined to go beyond those written statements. "Due to the ongoing investigations the company can’t comment on this," VW spokesman Eric Felber said by phone. "This remains an ongoing investigation," said Peter Carr, a spokesman for the U.S. Justice Department, who declined to comment further. Jones Day didn’t respond to two phone calls requesting comment. Still, new evidence could emerge as the probe winds on, said Michael Kubiciel, a law professor at Cologne University. White-collar cases tend to take years both in Germany and the U.S.
"It would certainly be ideal for VW if nothing more surfaced as to whether board members were involved," Kubiciel said. "In a case of that magnitude, one year isn’t that much. You can’t generally say there won’t be anything new surfacing." The VW leadership’s ignorance of the scheme wouldn’t bar German prosecutors from seeking fines, Kubiciel said. It’s enough to show that a midlevel manager participated in the crime. Yet knowledge by the management board could make it easier to prove fraud, the central allegation in the German criminal case, said Uwe Hellmann, a professor of criminal law at the University of Potsdam. Without the involvement of top leadership, prosecutors may have a hard time showing that the goal was to gain illegal profits, a prerequisite for fraud, he said. Engineers may have manipulated the software simply because they found no other way to satisfy demands by higher ups to meet strict U.S. emission standards. Their motive may not have been money, Hellmann said. The issue of what top executives knew and when they knew it is also crucial for a series of German investor lawsuits that seek about 8 billion euros ($8.7 billion) in damages. Brunswick prosecutors won’t discuss fine amounts with VW before the probe nears its final stage, said Ziehe, the spokesman. The inquiry is likely run through much of next year, or perhaps longer, he said. His office is investigating six additional suspects for manipulation of CO2 emissions data, another one for allegedly destroying information relevant to the probe. "Some of the suspects have comprehensively testified and there are also witnesses who told us a lot," Ziehe said. Former CEO Martin Winterkorn and VW brand chief Herbert Diess are also under investigation for alleged market-manipulation over how they disclosed the scandal to investors. VW has said it informed markets properly. Law professor Hellmann said it’s unlikely a smoking gun will suddenly appear, such as an email by a board member showing he was involved. Instead, investigators will likely look for enough circumstantial evidence to build a case that a top leader knew what was going on. "I can’t image such complex events can simply go unnoticed by the management board," he said. "That’s the gut feeling, at least. But for a criminal charge you need evidence."